This Japanese standard, in its broadest definition, is vinegared rice that comes in different forms with many variations. Often it contains raw fish. The potential is there for some real healthy eating -- if you play it right. The rice is the main player here. Nutritionally speaking, brown is better than white (higher in fiber). But sushi, really, is about the other ingredients. 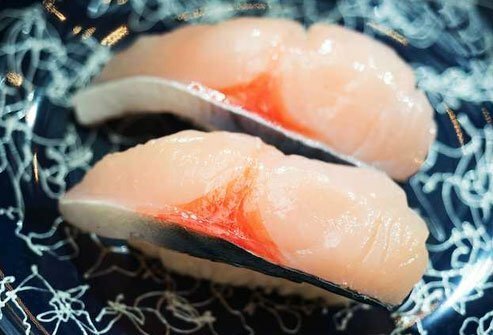 Sashimi usually refers to sliced, raw fish -- eel, octopus, tuna, salmon, swordfish -- you name it. If the fish is by itself, it's technically sashimi. But place it with vinegared rice and you have sushi. 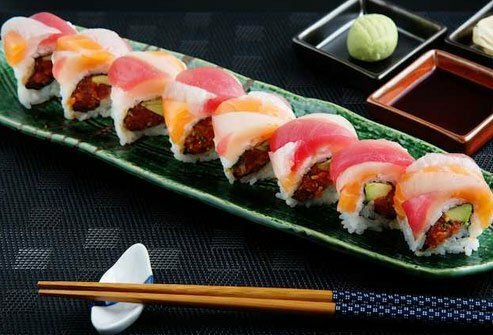 Another good source of omega-3s, tuna is a popular choice for sushi, inside a roll or served on top. 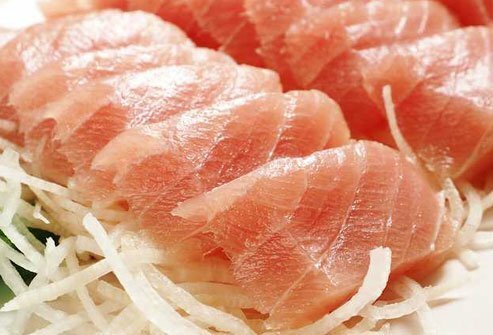 You have to be careful with tuna -- bigeye, for example, can be high in mercury -- but a serving a week is fine even for pregnant women and young children. Spicy tuna rolls? Be careful. Remember, add-ons like sauces can add fat and calories. 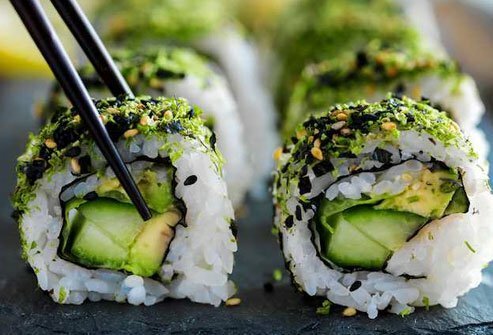 Many popular sushi rolls incorporate avocado, often with fish and vegetables but sometimes alone with the rice (and nori, sushi's seaweed wrapper). Avocado is high in heart-healthy fats and fiber, and it's packed with other nutrients. That can help your kidneys, your heart, and your nerves work better. 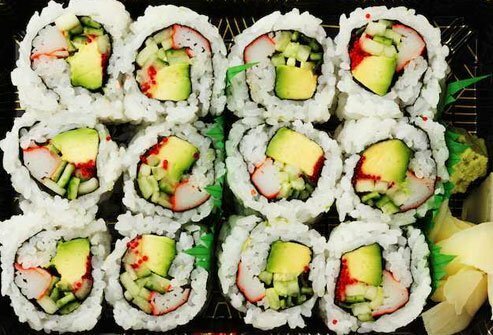 Sushi doesn't have to include fish. 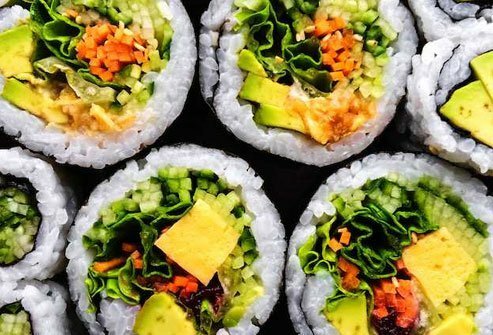 For the seafood-shy or vegetarians, veggie rolls (with things like avocado, cucumber, carrot, mushroom, onion, asparagus, and tofu) are healthy and readily available in supermarkets and sushi restaurants. Pickled ginger, by the way, is a common condiment served with sushi. It's meant to cleanse the palate between bites. 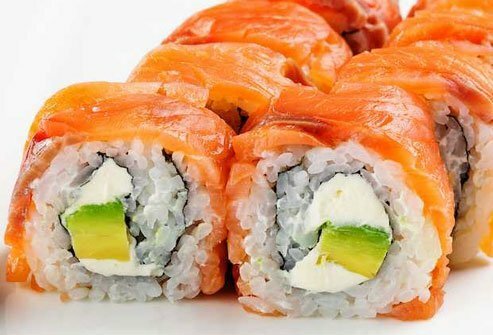 A classic in sushi, the California roll includes rice, nori, avocado, cucumber, and "crab" (usually surimi, or imitation crab, made of pollock, egg whites, sugar, and other stuff). It's sometimes served as uramaki (with the rice on the outside and the nori and ingredients on the inside). A California roll is generally OK if you keep away from high-calorie, fatty, mayonnaise-like dips and sauces. 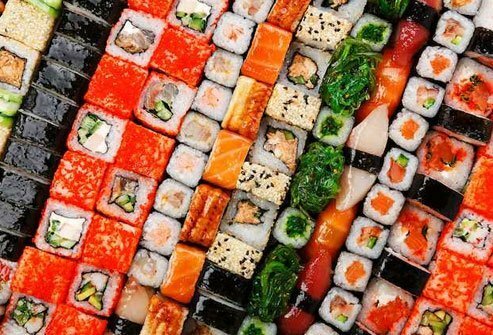 This is the Mount Everest of sushi, a combination that can include crab (usually imitation), salmon, shrimp, at least one kind of tuna and sometimes other fish. It's often a California roll topped with all the fish. It's protein heavy, and with all that fish and the avocado, it's fatty, but with healthy fats. Still, eat them in moderation. 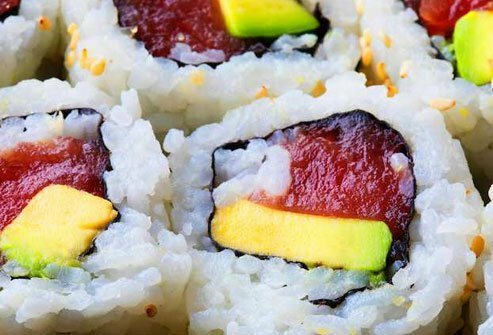 The Philly roll is one of those sushi inventions that may fool you into thinking it's healthy. It's not. A main ingredient is cream cheese, which is high in saturated fats and cholesterol and low in nutrients. 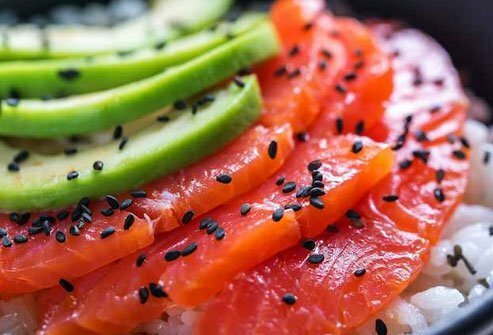 Even with the healthy bits in many Philly rolls, like salmon or avocado, unless it's made with low-fat cream cheese, it's probably best to skip it. Shrimp doesn't have nearly the nutritional value of, say, salmon (lower in many vitamins and minerals, higher in sodium), but it can be a source of protein and, to a lot of people, it's yummy. 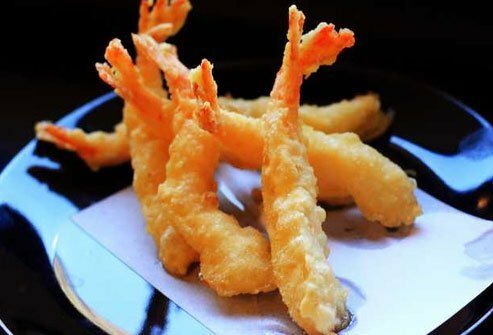 Stay away from tempura, though. That's a way of battering and deep-frying the shrimp. (It's done with vegetables, too.) It can add calories and fat. 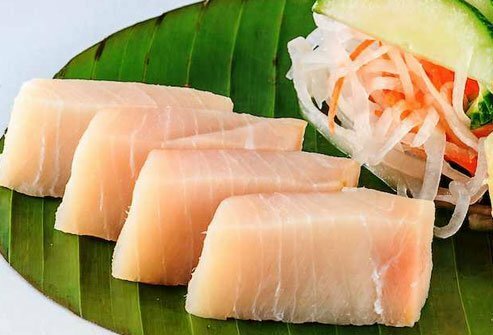 The firm, meaty flesh of swordfish (mekajiki in Japan) is considered a delicacy with sushi. 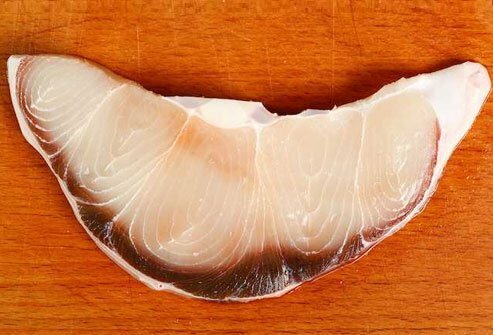 Unfortunately, swordfish is on the FDA's list of fish that small children, and women who are pregnant, may become pregnant, or are breastfeeding, should avoid because of potentially high levels of mercury. The same problem that swordfish has with mercury is true of shark. And marlin and king mackerel, too. One serving won't affect you much. Still, children and many women should steer clear. Known as saba in Japan, mackerel is another heart-healthy fish that's high in protein, omega-3s, and other nutrients. It makes an excellent choice for sushi. But be careful: While Atlantic mackerel is on the FDA's best choices list, king mackerel is on the list of fish to avoid because of its potentially high levels of mercury. Know what you're getting. 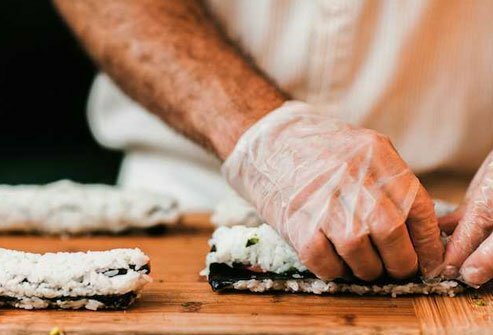 There's lots of sushi out there, and with a little practice, you can make your own healthy masterpieces, too. The dragon roll probably shouldn't be in the mix. 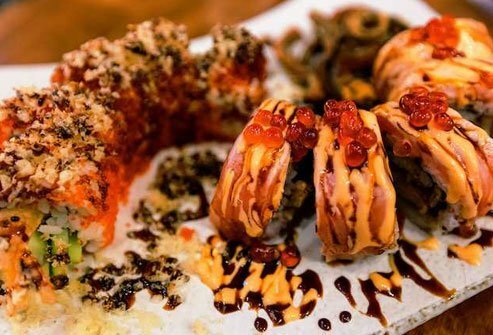 It contains unagi, or eel, which is high in protein, omega-3s, and vitamins A, B12, and D. But dragon rolls often come with a calorie-heavy sauce. Plus, unagi is endangered. Just avoid it. Harvard T.H. Chan School of Public Health: "Omega-3 Fatty Acids: An Essential Contribution." National Institutes of Health, Office of Dietary Supplements: "Omega-3 Fatty Acids," "Potassium." FDA: "Eating Fish: What Pregnant Women and Parents Should Know," "Seafood Nutrition Facts." United States Department of Agriculture, Agricultural Research Service: "USDA Branded Food Products Database." University of New Hampshire: "Avocados are Packed with Nutrients for your Health." MyFoodData, United States Department of Agriculture, Agricultural Research Service: "Nutrition Facts Comparison Tool." Hawaii Seafood Council: "Broadbill Swordfish (Mekajiki)," "Nairagi striped marlin (Tetrapturus audax)." FDA Compliance Policy Guide: "Processed and/or Blended Seafood Products." Monterey Bay Aquarium Seafood Watch: "Eel Recommendations."